Battleship Volya (Freedom) (till April 16, 1917 — Imperator Alexander Tretiy (Emperor Alexander the 3rd)). While Hetmanate and Ukrainian Peoples’ Republic times she was one of the first to raise the Ukrainian flag. Photo of 1916. Ukraine is maritime power that must protect its waters and economic interest at seas, protect the country from possible sea intrusion. The Navy should also serve this purpose. Right now the Ukrainian Navy consists of 28 ships… 27 of which require the overhaul or under repair already. Armored deck cruiser Getman Ivan Mazepa (Hetman Ivan Mazepa) (former Kagul, Pamyat Merkuriya (Memory of Mercury). 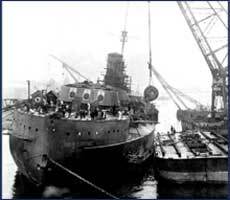 While Hetmanate and Ukrainian Peoples’ Republic times she stationed in Sevastopol. Broken down in 1943 only. The Ukrainian Navy arose in stormy 1917—1918. The Naval personnel of the tsarist navy mainly consisted of the Ukrainian recruits. Just recall one of the heroes of Sevastopol’s Defense seaman Koshka, a serf from Osmitincy village of Vinnitskaya oblast Peter Markovich Kishka. Upon the February Revolution of 1917 the Ukrainization spreaded over the Black Sea Fleet. Starting October 1917 the crews of the ships had been establishing military councils; the blue-yellow flags were flying from the masts. Destroyer Zavidniy (Enviable) and Pamyat Merkuriya were the first examples. The General Secretariat for Naval Affairs was established within the government of the Central Rada in Kiev (in January 1918 it was reformed in a Ministry). The head of it become D. Antonovich. The Head Navy Staff was led by Captain Yu. Pokrovski. For the educational and agitational purposes of the seamen the Central Rada seconded the commisars to Odessa, Nikolaev, Kherson and Sevastopol. November 22, 1917 the whole crew of the newest and powerful battleship of the Black Sea Fleet Volya made fealty to the Central Rada, followed soon by several ships and submarines. Rear-admiral M. Steblin a descendant of Cossack family of Shabliiv was appointed commander-in-chief of the Ukrainian Navy. A telegram to Kiev was sent form the staff ship Georgy Pobedonosets “Effective today the Sevastopol fortress and the Fleet in Sevastopol raised the Ukrainian flag. Admiral Sablin assumed the command of the Fleet”. Having no reply the admiral ordered to repeat the telegram started with the words “The Comrades of Kiev Central Rada…”. The brave officer was unaware that the Central Rada in Kiev was already a history at the moment. From October 1917 till March 1918 the following came to the disposal of the Ukrainians: nine battleships, seven cruisers, 18 destroyers, 14 submarines, 16 patrol ships and avisos, 11 military transports and mother ships. In addition the Fleet’s Headquarters, all military institutions and plants, all coastal fortifications were in hands of the Ukrainians. But they were yet to face a disaster. Kaiser’s forces had been advancing to Sevastopol with a goal to capture the Black Sea Fleet. Having no support from the land forces Admiral Sablin was forced enter the negotiation regarding cessation of hostilities. The Germans however had rejected the armistice proposals and the advance continued. The Centroflot (the combined fleet revolutionary committee) in order to save the Fleet took a decision on moving to Novorossiysk. April 30, 1918 the main high sea fleet under command of Admiral Sablin headed for Novorossiysk. Only 25 auxiliaries and small crafts as well as 15 submarines left in Sevastopol under Admiral Ostrogradskiy who assumed the command. May 1, 1918 the German army entered Sevastopol and two enemy battleships anchored in the bay. Under the guns of the enemy the admiral gave an order to the Fleet to strike the Ukrainian colors. That was the first tragical page in the history of the Ukrainian Navy. The modern Ukrainian Navy is fully equipped by the ships inherited from the former USSR. It is hard to imagine of the criteria that had guided the politicians while splitting of the Black Sea Fleet in early nineties but Ukraine obtained not the best part of it. Presently the Ukrainian Fleet consist of 28 ships, motor boats and other crafts: frigate Getman Sagaidachniy, built in 1993; submarine Zaporizhzha built in 1970; six corvettes, the oldest built in 1976, Lut’sk the newest in 1994; three assault landing ships – Kostyantin Ol’shanskiy – 1985, Kirovgrad – 1971, Donetsk - 1992; four mine warfare vessels all but one built in the seventies of the last century, Genichesk – 1984; three gunboats – 1971, 1972, and 1990; two sister ships missile boats Priluki – 1979 and Kakhovka – 1980; two amphibious ships Bryanka - 1970 and Svatove - 1979; three scout ships Slavutich – 1992, Simferopol – 1973, Pereyaslav – 1987; command ship Donbas – 1970 and anti-diversion boat Feodosiya – 1983. Car enthusiasts are well aware that upon ten years of service life their iron horse starts falling to pieces, which means you need to get rid of it as soon as possible. Was that the way our “big brother” in the Black Sea Fleet did? But a ship is not a car but a city with its own power plant, water supply, flushing system, ventilation, air conditioning, wastes treatment equipment, etc, stuffed with armament and ammunition. Its hull and machineries are under permanent exposure of hostile environment – sea water. Is it possible that our naval officials care the entrusted crafts so much that they can be easily called to protect our waters at any moment? The report The Technical Condition of Ships and Crafts of the Ukrainian Navy as of May 5, 2005 originated by the Deputy Commander of the Ukrainian Navy for logistics says that 27 ships are being refitted or require immediate repair. For the year of 2005 it is planned to repair 21 ships that requires 9207.8 thousand grivnas (what an accurateness! – author’s note). One gets really scared while reading the following words from the report “On route from Novoozernoe to Sevatopol the port engine was shut down on an emergency (assault landing ship – Kostyantin Ol’shanskiy – author’s note). An investigation was carried out … an estimated work cost makes 120 thousand grivnas”; amphibious ship Svatove: “… the outer shell is distorted and deformed in some places; immediate paining required. The underwater hull has a spreading corrosion; general condition of the hull is satisfactory (Thanks God! – author’s note). Fuel tanks subject to corrosion. 20% of the upper deck is covered with rust and needs maintenance”; command ship Donbas “The date of the last maintenance — 1986. The date of the next interim overhaul has expired in 1991”; fleet’s flagship frigate Getman Sagaidachniy — crankshaft of diesel generating set is broken; missile hydrofoil boat Kakhovka “Hull’s condition is satisfactory but hydrofoil run is impossible due to vast fouling”; assault landing air-cushion ship Donetsk (the only in the fleet) “Ship’s effective life has expired. The ship is to be excluded from the list of navy’s operational force and transferred into “equipment” category. Almost similar situation can be observed about every ship in the fleet. By the way somebody’s kids, grandkids, brothers, and husbands serve at this sort of “equipment”. The only Ukrainian submarine has long become a subject of numerous jokes. Starting February 28, 2002 the submarine is under repair at SSRZ (Sevastopol ship repair yard) of the Russian Black Sea Fleet. 60% of works of the total scope has been completed to date. The notorious accumulator plant of the sub is located ashore since February 2003 meaning the two years of the five year warranty period have already spent. Our dear Ministry of Defense (read – tax payers) let’s start accumulating currency for the purchase of the new plant. We are going to pay Russia for the sub’s repair over 15 million grivnas. The former president of Ukraine Leonid Kuchma noted in one of his speeches that basing of the Russian Black Sea Fleet is beneficial for Ukraine apparently meaning the funds due to the budget as community charges, land tax, custom duties for railage and other. This is right of course should our neighbor pay in time. For instance, the Assistant of the Russian Black Sea Fleet for financial activities admits “The Fleet (Russian – author’s note) year in and out is in debt to both military and Ukrainian companies – suppliers of energy and material resources”. Unfortunately Ukraine has got not a single manufacturer of naval armament. That is why we are forced to by it abroad mainly in Russia. But how stupid should be a government to supply his neighbor with the most sophisticated equipment? Who knows what is going to happen in the future. As a result we possess ships with expired operational life, not mission capable submarine, out-of-date armament. In other words all these are “equipment and materials”. A saying “The thing you don’t want is dear at any price” is true for our navy. So what, do nothing and let it sink by itself? Too early, it is not so bad. During the years of independence Ukraine managed to complete construction and commission four ships: frigate Getman Sagaidachniy, corvette Lutsk, command ship Slavutich, and assault landing air-cushion ship Donetsk. The following are at different stages of construction: missile cruiser Ukraina (Ukraine), corvettes Lviv, Lugansk, and Ternopol. The latter is being built at CJSC Leninskaya Kuznitsa for fourteen years already, as per the project 1125 Albatros (Albatross) developed yet in the seventies. The completeness of cruiser Ukraina makes up to 95%. About 150 million grivnas is needed to finalize the construction. Her fate is uncertain because it is being considered that she does not fit into the military doctrine of our country. Yet the aim of any country has always been the possession of maximum efficient armament. The future is not known for two hydrofoil corvettes being constructed at shipbuilding facility More in Feodosiya. Due to the expensiveness and operation complexity the ships have become hostages because of their own technical excellence. The Armament Program for the Period until 2010 specifies three main classes of ships for the Ukraininan Navy, namely corvette, missile boat and a mine sweeper. The program does not include submarines (although naval experts consider the need of three), landing crafts as the offensive weapon (?) and the fleet of auxiliaries notwithstanding the existence of military forces that can be supported from sea only. The projects for corvettes have been developed: Pahar-C in the Central Design Bureau Shkhuna (Shooner) located in Kiev, Mirazh (Mirage), Mistral – 1500T (foreign customer) and è Gaiduk – 21 (Heyduck) at the State Experimental Design Office of Shipbuilding in Nikolaev. The latter on account of using stealth technologies already today is being referred to as stealth-ship. Ukraine possesses unique shipbuilding potential but the lack of funding as always imposes obstacles in realization of designers’ ideas. Former head of naval shipbuilding and armament office in the Ukrainian Ministry of Defense Rear-admiral M. Serdyuk says in his interview for Sudnobudutovannya ta sudoremont (Shipbuilding and Ship Repair) magazine “The only thing is needed for the Ukrainian Navy, namely stable funding of the new ships construction program. Let the fleet be moderate but with the predictable future.” You can paraphrase the well known saying “Those not supporting their own fleet will be sure supporting the enemy one soon”. This is what we almost have today.